Palliative care can help address the needs of seriously ill individuals and their families. A 2014 CHCF project assessed how the supply of specialty palliative care programs compared to the estimated need for people in the final year of life, and found these services could meet just a quarter to half of the estimated need, with uneven distribution across the state. A 2017 update, Palliative Care in California: Narrowing the Gap (PDF), finds dramatic increases in the number of palliative care programs, the number of patients served, and broader availability statewide. Inpatient palliative care capacity for the entire state is now estimated to be sufficient to meet 43% to 66% of need, and community-based capacity is estimated to be sufficient to meet between 33% and 51% of need. And while in 2014, 22 of 58 counties had no community-based palliative care services, that number dropped to 6 in the 2017 analysis, and after data collection ended, this number shrank to zero, as every county in California could offer these services. The issue brief, an executive summary, and data files are available for download under Related Materials below. 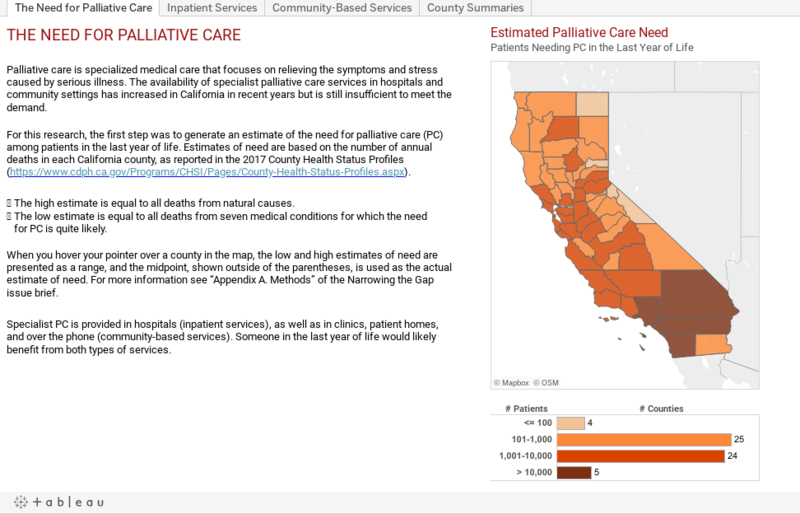 Use the interactive maps to examine the number, capacity, and sufficiency of inpatient and community-based palliative care services in California or for individual counties, and use the “County Summaries” tab for a searchable directory of programs by county. Details about methodology are available in the issue brief.